This ironically titled exhibition shines a spotlight on Ronnie van Hout, a Melbourne-based New Zealand-born artist best known for his distinctive brand of existential absurdism. Bringing together works that span more than 30 years of practice, 'No One is Watching You: Ronnie van Hout' encompasses sculpture, video, photography, embroidery and text, and features major new installations. 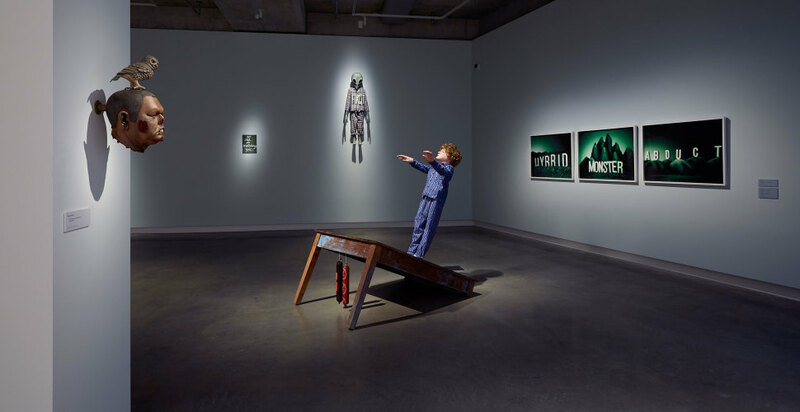 Van Hout's tragicomic oeuvre references a wide range of sources, from science fiction, cults and cinema to art history and popular and celebrity culture. He frequently draws upon childhood experiences and recollections to create wryly amusing yet heart-rending micro fictions. Casting fragile, lonely figures in the midst of perplexing scenarios, van Hout masterfully evokes familiar and yet strange interior worlds. His unsettling tableaux unleash deep social anxieties and feelings of self-consciousness, triggering the impulse to simultaneously laugh and cry. The multitude of protagonists populating van Hout's work includes figures from pop culture, peculiar everymen and wicked self-portraits. The latter appear to theatrically seize the artistic limelight while at the same time attempting to elude its searching glare. Van Hout's practice deliberately blurs the boundaries between self and other, artist and audience, tragedy and farce, at once humorously and poignantly exploring powerful sensations of the contemporary human condition. Curator: Melissa Keys. Presented in association with Melbourne International Arts Festival.